Dimensions 1.50 by 8.50 by 10.90 in. 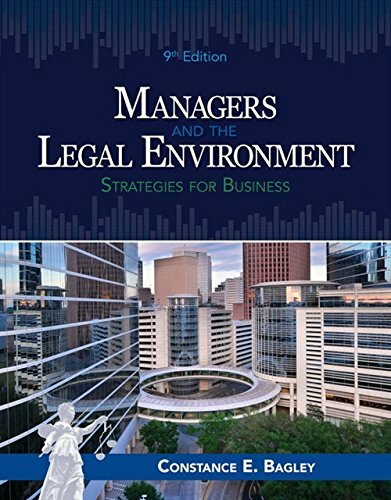 Amazon.com description: Product Description: With new cases and examples torn from the headlines, MANAGERS AND THE LEGAL ENVIRONMENT: STRATEGIES FOR BUSINESS, 9E equips you with the legal knowledge and risk management techniques for success as a business manager. Cutting-edge coverage and a strategic approach teach you to enhance realizable value, redeploy resources, and manage legal and business risk. Up-to-date coverage addresses the rights of workers at firms, like Uber, in the "gig" economy; the right of employers to restrict employees' social media; ethics of compensating workers who are tipped; law to protect children's safety on the Internet; Fourth Amendment concerns in searches of cell location; rules governing "crowdfunding"; and the ramifications of the EU's "right to be forgotten." You learn to use legal tools to create value, attain business objectives, resolve legal issues, manage risk, and handle legal disputes.